I've noticed something. I tend to start blog posts with the phrase: "If you read this blog, you probably know..." And then go on to say something about myself that you would likely know. Not this time. This time, I'm going to impart some wisdom about me and then I'm going to impart some general knowledge that you should already know, which will contradict what I just told you about me. Confused? Good! Let's begin! 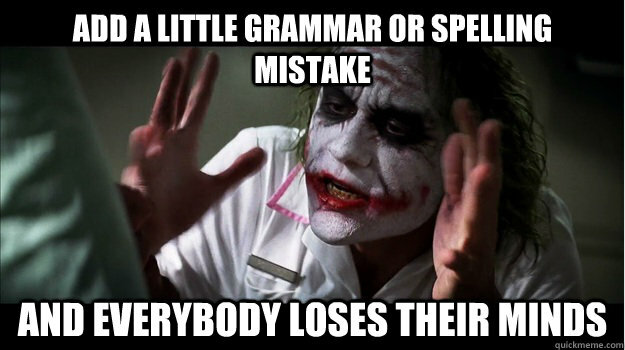 You probably don't know this about me, but I'm not a big fan of grammar snobbery. I'm even less of a fan of people who point out that others are using words wrong. Especially on the internet. I know there might still be some folks out there using computers, but personally, my social media usage is via mobile device only and let's face it, autocorrect is not the artificial intelligence that will one day take over the world. Ducking help, it's not! Correcting someone else's grammar is going to at best make you look like a jerk and at worst make you look like a racist jerk. Vernacular and regional accents are a thing. Hell, internet speak is a thing, hence calling things a thing. Seriously though, look up any list of misused phrases and you're bound to find a lot of cultural insensitivity disguised as academic prowess. But as I was looking through these commonly misused phrases, something hit me. These snooty academics were no more righter then the person's they was calling wrongest. If that sentence made you want to gouge out your eyeballs, stop reading. Going any further or farther would be a moo point. For the rest of you, sit back, relax, and get ready for the grammatical education you didn't know you needed. This is clearly the most popular, the your/you're if you will, of wrong headedness. I mean really, if your purposes are intense, you should at this point find a new way to phrase your meaning. Think about it. Your point may be so compelling that the coast line becomes thick with the stubby snouts of Flipper's brethren all bending an ear your way. You may be inclined to jump up on your highly opinionated horse, but in the end, all you did was capture the attention of a bunch of silly marine mammals. I'm not going to lie, this one smacks at an issue of dialect and I almost didn't include it. But even those of us from the Midwest or North who tend to suppress the letter T sound should not show our ignorance any longer. This is the process of using collected data and a specific algorithmic set of standards to decide at what point it becomes cost prohibitive and/or a drain on resources to pursue a criminal conviction. Another example of dialect. The proper spelling for this really ought to be case 'n point since the N sound is all anyone of any geographical location or ethnicity ever actually pronounces. I mean, if N'sync and Guns 'N Rose got it right, can't we all? In reality, if you are trying to cite an example that best illustrates what you are talking about, you should use the analogous vegan argument that sometimes something may look free from animal products, but a trace amount of animal byproduct exists. Of which, casein is a prime example. See also, wheys and means. Seriously? You're going to argue with Judas Priest? Whether you think thing or think is correct, you have to admit, this is kind of a pretentious way of saying "You're wrong, dumbass!" The correct phrase: You've got another drink buzz on. As in: If you think anything I just said makes sense, go home, you're drunk. There. Now you know and as a bunch of trigger happy, patriotic cartoons once told us, knowing is half the battle. Yeah, let's see how many people don't make it down this far before telling me I've got a typo in my title. Yeah, I used to be "one of those" who would look to correct people - until it was done to me a couple days ago and I realized what a complete tosspot* I sounded like. *No, I'm not British. I just like there** slang.